The EWU Library Catalog gives you access to all the library's books, videos, CDs, government publications, as well as articles on all subjects. All of EWU’s physical holdings, including books, videos, CDs, government documents, and more. All the physical holdings of all the Summit Libraries—over 9 million titles! Citations for millions of articles. How do I search the catalog? | How do I locate an item? | I can't find the specific book or video I want. | How can I get more help? If you don't have a particular item in mind, type in your keywords as you would in Google, as a string of words. Put exact phrases in quotes, e.g. "college students"
To find variations on a word, type the stem of the word followed by *, e.g. success* to find success, successful, etc. If you want to look for either word/phrase, the Boolean operator OR must be in ALLCAPS and in parentheses, e.g. (STEM OR science*). Know the title or author? If you know the exact title of the item, type in the title "in quotes" and the last name of the author (if known). Because the EWU Library Catalog has records for all types of resources, you will very likely need to limit your search results. Note all the limiters on the left side, as well as some quick limiters at the top. Click on the limiter to narrow by the one limiter. 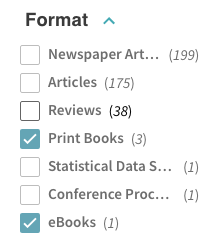 You can narrow to more than one in the category by clicking the corresponding boxes on the left of the limiter (such as limiting by Format to both Print Books and eBooks). Just hover over the limiter to see the box. You can exclude particular limiters by clicking the icon on the right of the limiter. Just hover over the limiter to see this icon. Subject Terms -- because the subject terms given to articles and books are can be different, it is best to narrow by Format first, then Subject Term. See the push pin icon on the far right (labeled "Keep this item" if you hover over it)? Click it and it will change the push pin icon and highlight the brief record yellow. You have marked a record temporarily. Click the push pin icon in the top right corner to view your marked records. Note: To permanently mark a record, you need to be logged in. Click the Sign In tab in the top right corner. How do I locate an item? The last line of the brief record describes where the item is located. If the wording is green, that means it is readily available, either online or physically on our shelves at the JFK Library in Cheney or Spokane Academic Library. 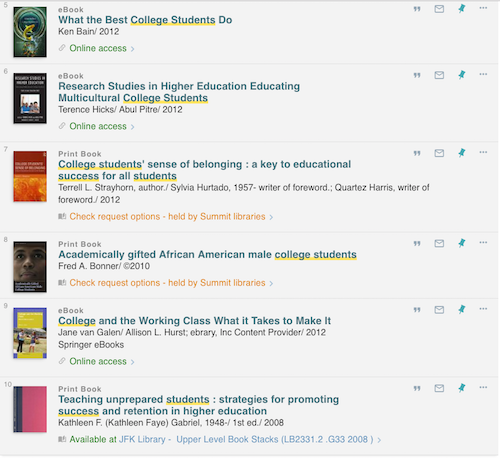 For online items: click the green wording (Full text available, Online access, etc.) to link out to the item. If the wording is yellow, that means you'll have to request it. Click Check request options - held by Summit libraries. You must be logged in to request the item -- you'll be prompted to if you aren't already. Click REQUEST. You will be notified via your EWU email address when the item is ready to be picked up. The EWU copy of the item is checked out. You will have to request it from a Summit library, or via Interlibrary Loan if there is no other copy in Summit. The article is not available online. It may be in a physical copy of the source (and it will display the date range held and call number), or you will have to request it via Interlibrary Loan. I can't find the specific book or video I want. While the EWU Library Catalog has millions of records, it only will search through the holdings of the 39 Summit libraries. If you can't find a specific book, video, CD, etc., then go to the EWU WorldCat Catalog and re-do your search. WorldCat has records from thousands of libraries worldwide. You may request the item via Interlibrary Loan. Please contact a reference librarian by calling 359-2263, or go to Ask a Librarian to chat or send an e-mail.